Who can resist stopping to shoot a fine bit of neon on a swoopy sign? 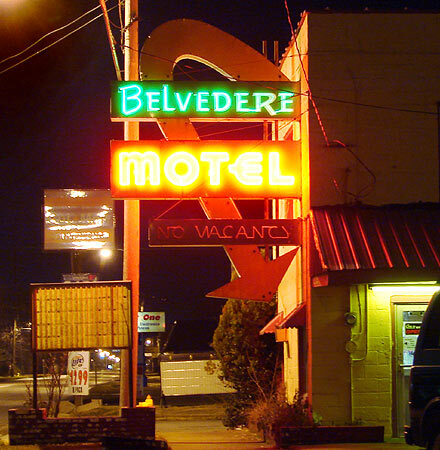 The Belvedere Motel is in Cairo, Illinois, which is pronounced "care row", unlike the Egyptian city. Cairo is a sliver of a town located at the southern tip of Illinois between Missouri and Kentucky. The Mississippi and Ohio rivers meet here, and the town was a happening place back in the heyday of river travel. Sadly, Cairo's fortunes changed and its business district is now a virtual ghost town of boarded-up buildings. The Belvedere plugs along, though.